The CE-TECH White Duplex In-Line Adapter offers a simple way to maximize your single jack by splitting it 2 ways. This adapter contains 4 conductors and an in-line design. With 4-conductor modular plugs on each end, the CE TECH 12 ft. Phone Line Cord easily connects phones, fax machines and modems to a phone jack. This cord offers a limited lifetime warranty. CE Techs Voice Grade Jacks are used to terminate Category 3 network cable. It is used for phone, fax modem. These keystone jacks snap into any housing or keystone wall plates. 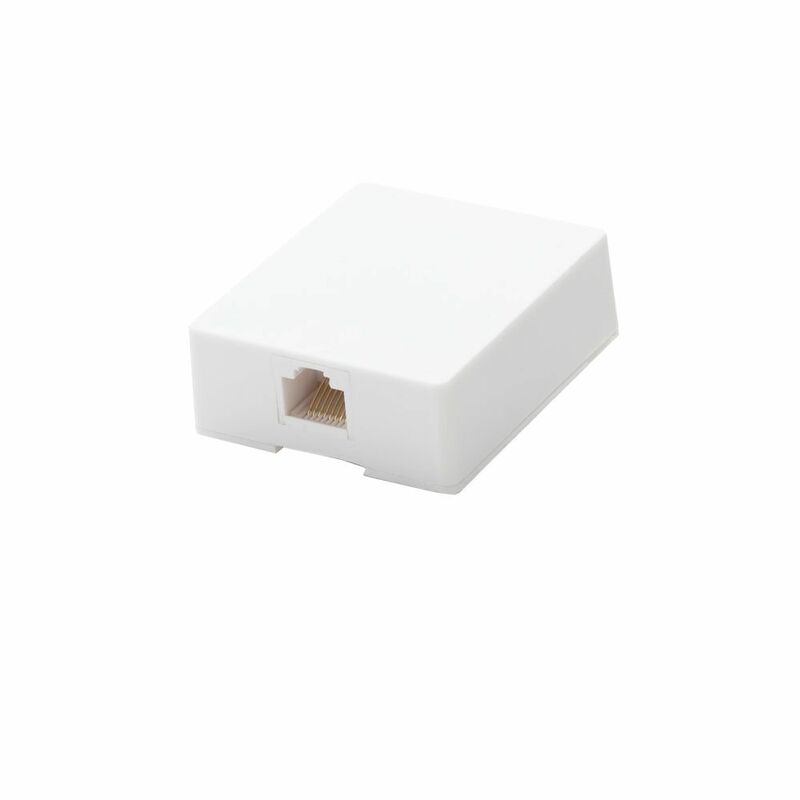 Surface Mount Ethernet Jack The CE-TECH White Duplex In-Line Adapter offers a simple way to maximize your single jack by splitting it 2 ways. This adapter contains 4 conductors and an in-line design. Surface Mount Ethernet Jack is rated 3.8 out of 5 by 8. Rated 5 out of 5 by Bobby from Just what I needed for my cell connection for long... Just what I needed for my cell connection for long distance use. Rated 1 out of 5 by Jeff from This is not Cat 5 compatible. This is not Cat 5 compatible. Rated 5 out of 5 by crankin from Sure it doesn't match up to typical color codes for Cat5/e standards but it includes a chart in t... Sure it doesn't match up to typical color codes for Cat5/e standards but it includes a chart in the box that shows both A & B color codes and how to match it up. If you can't match it up, especially with this easy to understand color code chart, you shouldn't be doing this yourself anyway. Good product for the money. Includes both sticky back tape and 2 screws for permanent mounting. Rated 4 out of 5 by HomeOwner1 from Solid, functional choice CE Tech has changed the packaging of this product, and they now include the appropriate wiring sequence (although the correct sequence is noted and correct in Lucas1Potter's review). Yes, this uses screw terminals and not punch downs, which, if you're looking for the fastest possible connection, isn't ideal. But, if you're looking to add one Ethernet terminal to your house, is perfect. This took me 15 minutes to wire it up, and that included two trips to the basement (from the 2nd floor) to grab tools, and then drill the hole in the wall to snake the wire through. Is this perfect? Nope. But it's a heck of a lot cheaper and a heck of a lot faster than the alternative. The alternative is spending $30 on a decent punch down tool, plus the block, plus the face place, plus a box, and you'll need to cut into your wall, mount the box, etc., etc., etc. My only complaint is that there wasn't a hole in the back plate to run the wire through. The wire runs through a slot in the side of the jack opposite where you plug in your patch cable. It's not a big deal, I drilled out one of the screw holes -- problem solved. Rated 3 out of 5 by RFGuys from Works - but not at Gigabit speeds This particular jack uses screw terminals to attach to the network cable. You must use care, the internal wire jumpers are not the standard wire colors used in typical Ethernet cable. Once wired properly, a solid connection could be made, but only at the 100 Mbps speed. Gigabit speeds were not supported, probably due to the screw terminals and inch-plus lengths of unpaired wire needed to attach to them. Rated 4 out of 5 by Chris from Works Fine This jack is exactly as it looks and works fine. The wire color may be non-standard for Cat5, but you have to be truly unskilled to be unable to match up consistent colors on both ends or not to be able to figure out the pin layout. Anyone with the smallest amount of skills can figure out how to wire an Ethernet cable with these even with the non-standard wiring colors. If you really need instructions then you shouldn't be trying to install this yourself. Rated 3 out of 5 by CheesePatrol from Not great, but it works As noted, this jack uses screws to secure the wires and there's no cutout for the stripped wires. This is by far the biggest flaw. A punch down block would have been be great. Also, like others mentioned, the wire colors don't correspond to RJ45 standards, but there is a chart included with the instructions. Just takes a minute or two extra to match up the wires. All in all, it got the job done.